TOKYO -- After less than a month on the job, Honda Motor Co. CEO Takahiro Hachigo has outlined his vision for a "new Honda." Much of the plan echoes the mantra of a now-flourishing rival. 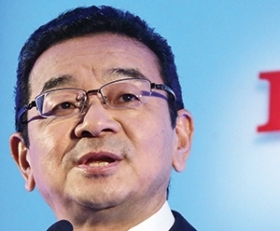 Hachigo, 56, a veteran r&d engineer who took office June 17, aims to prioritize innovative cars, abandon aggressive growth targets and maximize existing production capacity before adding more. If the formula sounds familiar, it should. Toyota Motor Corp. President Akio Toyoda steered his company on a similar course after its financial stumble during the Great Recession and its 2010 unintended acceleration crisis. In some ways, Honda is recovering from a similar bind. Former CEO Takanobu Ito handed control to Hachigo as the company was just regaining its footing after several body blows. The Japanese company's reputation, long envied as cutting-edge cool, had slumped into ho-hum territory, with critics saying some recent products fail to stand out in the mass-market crowd. The carmaker was then broadsided by the global recall of millions of vehicles to replace faulty Takata airbags that have now been linked to eight deaths. And a series of embarrassing recalls of the redesigned Honda Fit small car in Japan forced Ito to delay several product launches and overhaul r&d strategy. Meanwhile, Ito expanded worldwide capacity to chase his goal of 6 million sales globally in the fiscal year that ends March 31, 2017 -- even as demand failed to keep pace. Honda sold just 4.4 million vehicles in the fiscal year that ended March 31. 1. Better integrate Honda's six global operating centers. 2. Regain focus on innovative and exciting vehicles. "I plan to create a new Honda," Hachigo said. "Rather than focusing on numbers, it is important to come up with products that carry dreams and satisfy our customers," he said. "We will focus on the development of innovative products." Last month, Honda restated its earnings to notch a 19 percent drop in operating profit for the fiscal year that ended March 31. Honda took the hit after booking larger-than-expected costs to handle expanding recalls of Takata airbags. At Honda, rampant expansion to create six global production and r&d hubs led to overcapacity that is also undermining profits, Hachigo said. "We want to make best use of these sites on a global basis, so the regions can supplement each other," the new CEO said. "That is the next step." From now on, Honda increasingly will use production sites outside Japan as global export hubs, he said. For example, Honda will ship the five-door Honda Civic hatchback and high-performance Civic Type R from its assembly plant in England to global markets. It will also ship the CR-V crossover to new markets from its plant in Canada. Finally, instead of sourcing the European-spec Jazz compact locally, it will ship that car from Japan. Honda, the first Japanese carmaker to build vehicles in the U.S., now makes 81 percent of its vehicles outside Japan. In the first five months of this year, Honda's exports from Japan plunged 27 percent to just 9,620 vehicles. North America alone accounts for 40 percent of its global sales. Hachigo was vague on details for much of his product plan. But he said the company will spend more time on r&d to develop better products more attuned to market trends. The guiding principle, he said, will be products that deploy innovative technology that has yet to be marketed. Hachigo cited the S660 mini sports roadster, sold only in Japan, and Honda's commuter jet business as examples of the new spirit he wants to see in Honda's products. Also on tap: A redesigned Civic small car, expected in Japan this fall and the U.S. next spring, that will get a new platform and downsized, turbocharged engine. Those technologies will be deployed to other nameplates, Hachigo said. "My first priority should be coming up with Honda-original products," he said. "That will be the most important pillar." In one important way, Hachigo does not seem to be following Toyota's playbook, noted Chris Richter, an auto analyst at CLSA Asia-Pacific Markets in Tokyo. Toyota effectively stepped up its positioning of its high-margin Lexus luxury brand as a global profit engine. In contrast, Hachigo uttered the word "Acura" only as a brief aside in his hourlong press conference, entirely glossing over any plans for his company's struggling America-centric luxury brand. Hachigo, despite touting "Honda-unique" technologies, even failed to use the opportunity to trumpet the unique three-motor hybrid system it will deploy in the upcoming Acura NSX halo car. "It was just mentioned vanishingly," Richter said of the Acura business. "It isn't a priority, and it needs to be." Overall, though, Hachigo's approach emulates that of Toyota's Toyoda, who took over his family's namesake automaker just as it was booking its first operating loss in seven decades. Toyota was soon hit by its own recall crisis. The problems prompted Toyota to halt new factory construction, maximize the use of existing capacity, redouble its focus on quality and adopt "fun to drive" as its guiding maxim. Toyoda's remedy worked. Toyota now expects its third-straight year of record profits in the fiscal year ending March 31, 2016.